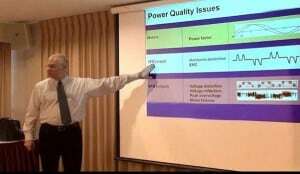 Power Quality Seminars. In-person or web-based. Our location or yours. Customization available. Power Quality Seminars and Training for Harmonics, Power Factor, PWM Voltage and more. In person or web-based seminars can be customized to meet your needs. Our seminars are purely educational and without any sales pitches what-so-ever. See our Events Page for Currently Scheduled Seminars and Training Events. You may call our office to schedule a private seminar. Please call us at 1-262-618-2403 or Contact Us here.